eTicket solution fosters day-to-day operations of different categories of employees, including job supervisors and their subordinates working in the field, accountants, and project managers. Sturgeon Services International (SSI) is a large Californian construction company providing full-cycle contracting services for oilfields. With numerous service lines and 1,000+ employees on board, the construction company was looking to revamp the ways they handled information provided by construction site workers and billing requests. With this in mind, SSI wanted to implement a comprehensive software package that would allow automating organizational business processes. Considering the size and complexity of the project, SSI decided to involve a third-party web app development company instead of their in-house IT department. To select a provider able to deliver a suitable solution at a reasonable price and time, SSI carried out a bidding procedure and chose Iflexion as a project partner. While considering a new solution, the Customer aimed, above all, at preventing possible human errors while employees collect and submit information on consumed resources. The company also wanted to establish a transparent billing process and to speed up invoice processing between SSI and their clients. Apart from that, the Customer planned to integrate the solution with the company’s payroll system and the recently purchased Viewpoint platform to ensure the homogeneity of the corporate information and processes. Having analyzed the company’s existing processes and needs, Iflexion came up with a concept of a custom enterprise ticketing system called eTicket. Once the Customer accepted the concept, Iflexion’s development team started to bring the solution to life. Work ticket submission: a user-friendly web interface for supervisors to submit project-specific information on personnel, equipment, used consumables, performance metrics, etc. Ticket workflow support: as every ticket passes through multiple statuses and validations, the system supports the entire ticket’s lifecycle and ensures data consistency. Invoice generation: upon process automation, an invoice is generated in a click (previously, employees had to create and calculate invoices manually). Report generation: managers can access a variety of operational reports to follow staff productivity and project effectiveness, as well as to control and optimize corporate expenses. Work ticket processing is an important component the Customer’s daily activities. It implied employees to manually register the information on the used resources, make reviews, validations, calculate project costs and create invoices. These tasks were time-consuming and required substantial human effort, what’s worse, they were coupled with a high risk of mistakes. A dedicated enterprise ticketing system allowed the Customer to reduce the amount of resources required to support an effective ticket workflow and minimize the number of errors. Supervisors create web-based work tickets on a daily basis, listing all the resources used for a particular task or project via an intuitive and user-friendly web interface. Authorized reviewers (data checkers) review and validate the created electronic tickets using pre-defined validation rules and algorithms. Once the data gets validated, it is exported to the Viewpoint-based central repository via the Scheduler application. 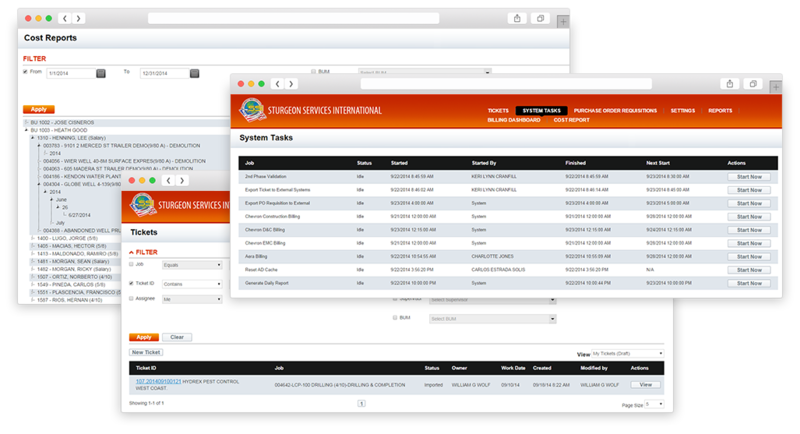 The system then uses the data to automatically form invoices for the SSI’s clients. eTicket also enables supervisors to run tasks either manually or automatically in accordance with the pre-defined schedule. The corresponding work tickets are attributed with the relevant statuses: draft, under review, validated, imported etc. A filtering system implemented within the solution enables users to search for work tickets by their unique number or status. Using the Crystal Reports application, Iflexion’s team developed a web-based dashboard, enabling managers to run a variety of reports to assess personnel performance, equipment utilization, and overall project effectiveness. The reporting functionality enables the Customer to get accurate statistics at any moment, which helps them optimize particular workflows, correct business processes and reconsider project expenses. To create the enterprise ticketing system, Iflexion leveraged the ASP.NET MVC technology, which uses the Model View Controller (MVC) concept that makes interactions with the application smoother and quicker for the user. To create client view models and declaratively bind DOM elements with defined models, the development team leveraged Knockout.js. A Windows service scheduler helped developers to schedule tasks while the Quartz framework allowed configuring the runtime. The team also employed Entity framework as an object-relational mapper to facilitate the work with databases. To ensure fast response and high performance of the solution, the development team implemented separated data storages to sort out data flows. The eTicket SQL database is used to store eTicket and payroll information while the existing Customer’s Viewpoint database stores all business-related data. To guarantee the high quality of the delivered software and its compliance with the project specification, Iflexion assigned professional QA engineers who performed smoke, functionality and regression testing, as well as the acceptance testing. Automating data collection, invoice generation, and report generation, the delivered eTicket system brought significant resource and cost savings and contributed to a more accurate and quick enterprise data processing. Iflexion’s team has become the SSI’s reliable technology partner. Currently, our team delivers maintenance and support services, expanding the system’s functionality and ensuring its smooth and reliable work.